Here are some photographs that I took of various custom-built "gizmos" that I've built the past few years. Click on any of the small thumbnails for a larger image. Each unit was customized for my client's requirements. I have adopted a "classic black" mindset, which also works well with most front panel layouts. Instead of easily-eroded panel legends/markings (silkscreen, etc. ), I've chosen mechanically engaved panel markings that do NOT rub-off over time. Fortunately, I've also found a local artisan who owns computer-controlled engraving equipment that ensures permanent panel legends. I have spent thousands of hours as a session/recording engineer under the typical dim lighting found in a studio, so legibility of the panels became a priority to me...even if the original panels weren't all that legible to begin with! All of these devices also included an external power supply box; for a custom-made unit, that is the best solution to minimize AC mains-induced noise. 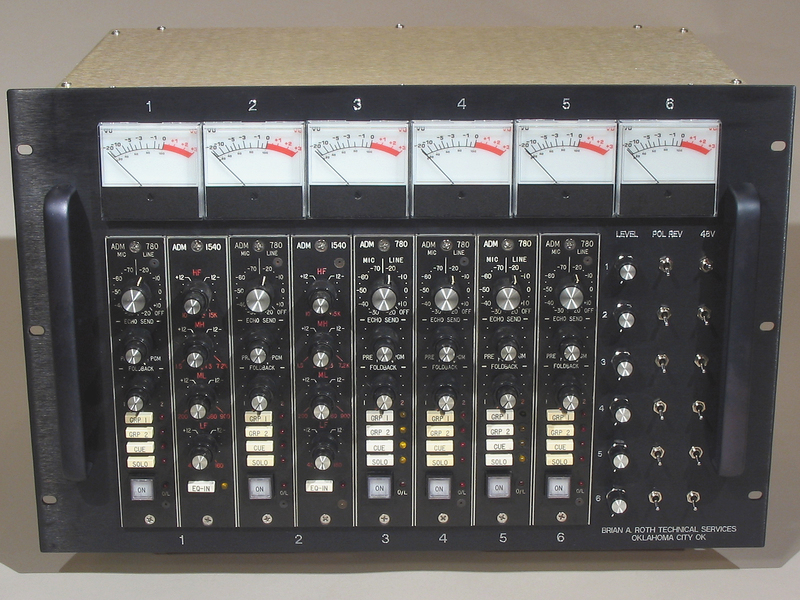 This shows an early rackup project of a pair of Audix modules, built to a client's specs, which included plenty of internal bracing to withstand shipping of the unit as it travelled from one studio site to another inside of a "road case". 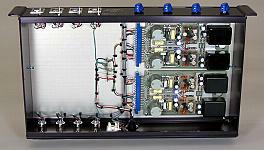 Here is a simple rack-up of two ADM 780 preamp modules. I added the controls and switches which became missing after the module was removed from the original desk mainframe. 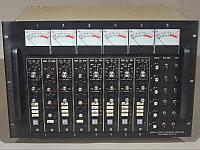 Eight ADM (six 780 and two 1540) modules along with backlit VU meters are shown in this pic. 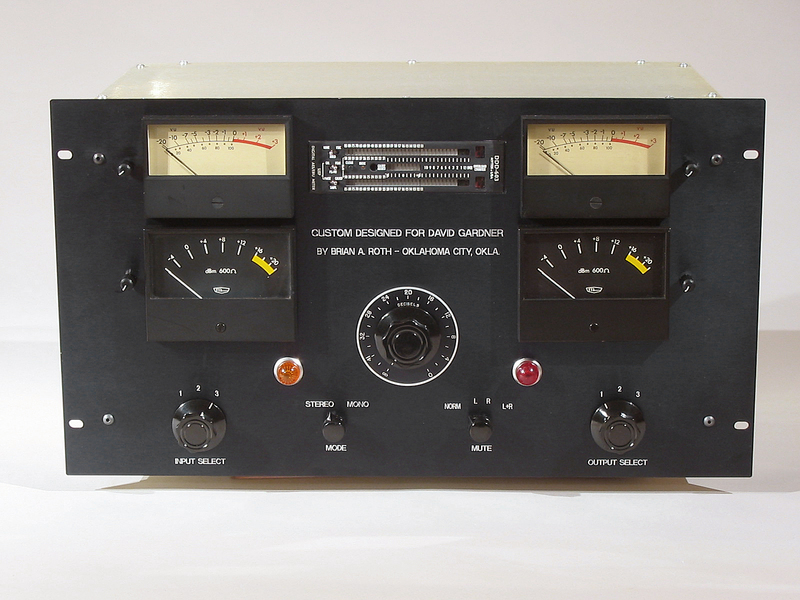 I also design custom power supplies for anything ranging from an entire mixing desk to a small unit which is part of a rackup. Shown is the PSU for the 8 module system shown above. Another simple rackup of two Auditronics 110B modules. My client sent me the rack chassis with the required machine work already done, so it required only engraving and internal wiring. Mastering control devices consist of a short analog signal path. This picture shows a "DC to Daylight" unit I built for a Mastering studio which had a passive "main" signal path. I always strive to constuct my custom devices using the best materials, and the best of my skills. 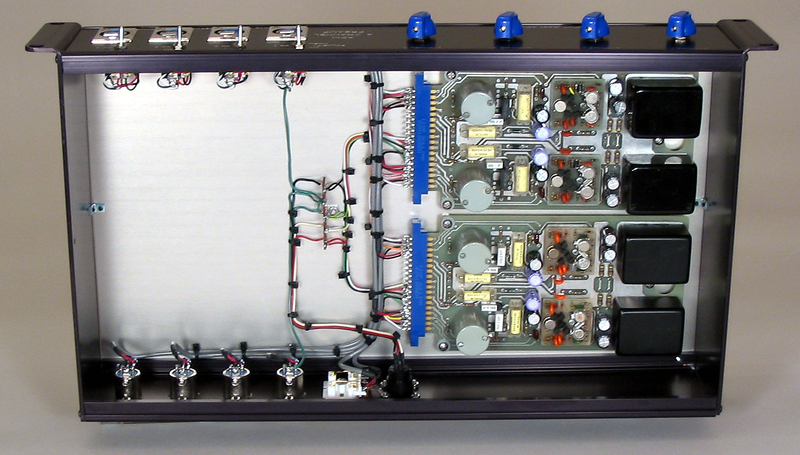 Here is a pic of the "innards" of a custom 4-channel preamp, with a pair of 2-channel ADM preamp cards mounted into a rack chassis. Any custom product that I build is ALWAYS CONSTRUCTED to the specs of my client. Hence, I cannot compete with "Chinette" gear sold at the "guitar stores", and I have no interest competing with those imported, mass-marketed "goods" (which is an oxymoron in itself).